We're back from vacation, I hope you all had a great Thanksgiving! We sure did, and we celebrated our little guy's 1st birthday too. It was a whole week full of parties and overeating. But we didn't mind that at all. My boy turned one. ONE. I can't believe it's been a year already. He's just growing so fast (maybe a little TOO fast, he's already in 18 month clothing)! 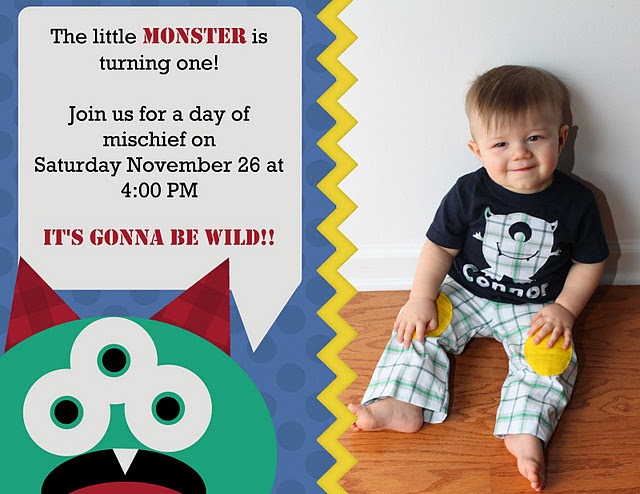 To celebrate, we threw him a Little Monster 1st birthday party, customized monster shirt and all. We had a great time! The invitations were made using my new digital scrapbooking software by My Memories. I actually designed the monster myself using various shapes that were included in the software. For the food and decorations, I kept it somewhat simple (if you don't count the time I took to design 25 monster sandwiches :) The plates, napkins, banner, table cloth, and pinata were all purchased from Target (I couldn't believe my luck when I went to the party aisle and saw that they had monster party supplies!) We also decorated with some streamers and balloons - again, I wanted easy stuff! The food was my favorite part. We made "monster fruit dip" by combining a package of cream cheese and a container of marshmallow fluff and dying it green. And my absolute FAVORITE part was the monster sandwiches (tutorial to come!) in turkey and ham, complete with olive eyes and cheese teeth. Little monster cake pops with a foam board covered in tissue paper as a stand. And of course, the cake. I found this cake on Pinterest and was determined to duplicate it. 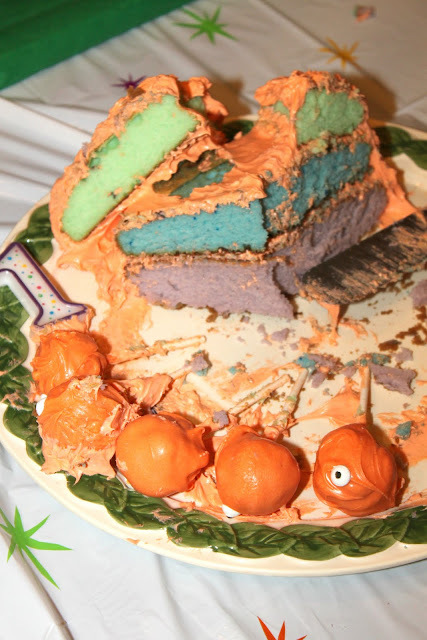 I'm going to man up and confess that I had to Photoshop this picture a bit to cover up the fact that the cake split in the back some after sticking the cake pops into it. It was kind of a bummer that it didn't turn out exactly like I wanted, but I told the perfectionist in me to chill out because it was still pretty dang cute I think. Major props to my mom for piping on all the frosting "fur"! The cake was 3 layers, with each layer dyed a different color! Note to self: in the future, purchase professional food coloring and not just the little tubes from Wal-Mart. I didn't get the exact colors I wanted, but they were close enough. 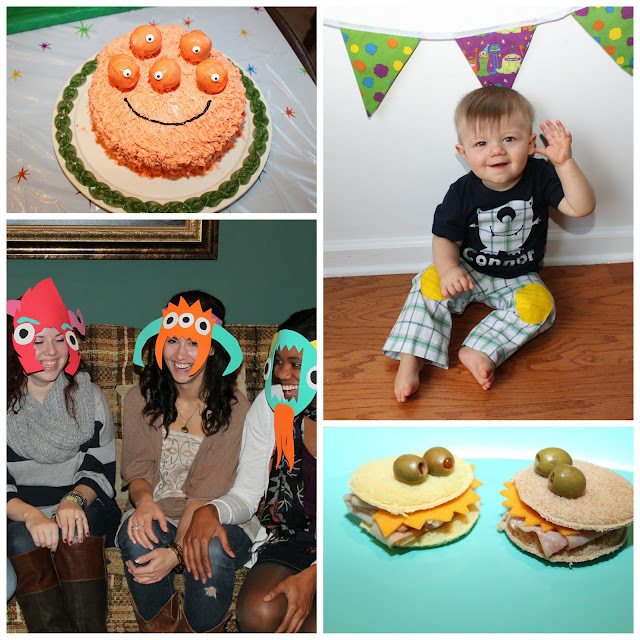 We didn't do any party games because Connor is so little, but my awesome sister-in-law made these great monster masks out of foam which made for great photo props! At present time, Connor wasn't too into the actual gift opening. He was more interested in feeding me the wrapping paper. But we had a great time catching up with friends and family and celebrating Connor, my favorite little monster boy. Haley didn't even mind sharing all the attention. Just for a little while. She looked adorable in her monster shirt too. I'll be sharing more of the details on the party soon! Aww, happy happy birthday! What a cutie! Love the party. The sandwiches and cake are awesome. The masks look like a lot of fun. 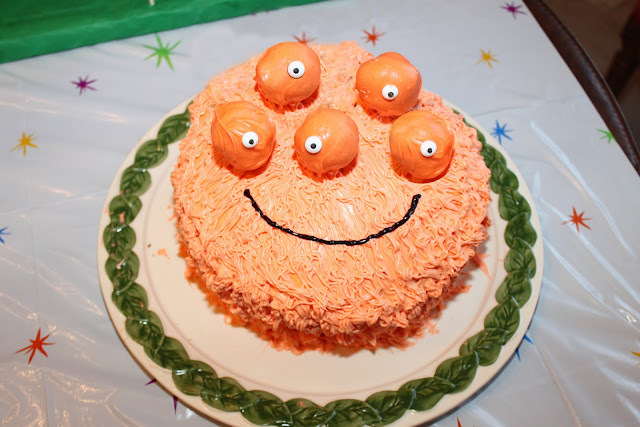 I think your monster cake is great!! Monsters was the theme for my baby's nursery and baby shower. :) It really is cute. And Connor's outfit is adorable! So creative. Loving his outfit and the cake! It looks like you all had a blast. Super cute! Love all of the little monster touches. So precious! The monster sandwiches are AWESOME! Love them! Love his outfit too. Did you make it? I made my son a monster shirt, but it ended up looking like the ghost on Pac-Man. Love all the monster party stuff you found! So, so cute! The cake is adorable too.